All your belongings deserve the best of care. That is why we handle all your items knowing that each one holds value whether it's monetary or sentimental. No matter how big or small make sure all your possessions are handled properly and by experienced professionals to ensure a safe, pleasant, and timely move. Strategically use our movers to pack only specific types of items, or to focus on bigger sections of you home such as your kitchen, garage, or dining room. 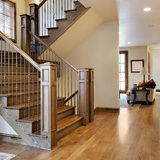 This will allow you to keep a hands on approach while delegating other task to our movers. We understand that while sorting through personal effects such as old photos and belongings, it is easy slow down and to get lost in memories of the past. This is one of the reasons why we recommend that our customers delegate the bulk of the packing and unpacking to us. Our Blue Bins offer the perfect balance between durability and longevity. 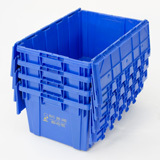 The superior alternative to traditional cardboard boxes, these plastic bins will protect your belongings, provide easy stacking, and ensure the safest trip to your new home or office. More Details. For local or long distance moves, and depending on your specific needs, a relocation specialist may recommend some of the following materials for moving. You may also request more or less of any particular material. Allows delicates to be safely wrapped with a thick bubble barrier and is most optimal when supplemented with plastic moving bins. Good for any delicates such as glass, crystal, porcelain, artwork, etc. Comes in 3 sizes, 12'', 24'', and 48''. Light barrier polyethylene. 3/16'' thick bubble, perf. 12''. 750' L x 12'' or 48'' W.
Polyethylene foam, cellulose wadding, tissue and kraft paper all are handy for packing and shipping. They help absorb vibrations and keep fragile items stationary during handling. They're clean too, which saves from mess and cleanup for both the shipper and the receiver. Keeps all your furniture tight to prevent it from collapsing. Allows for maneuvering and transporting to next destination by keeping it sturdy. Helps in scratch and damage prevention. 80 guage film, 1,500' L x 18' W.
Great for wrapping dishes and other breakables. Clean white unprinted newspaper. Ideal wrapping method when supplemented with plastic moving bins. Approx. 27'' x 30''. Rolled bundle. Protect furniture and other large delicate items by wrapping with paper pads. The practical solution for shipping overseas or long term storage. 30# kraft outer sleeve 1 chip, 1 non-woven inner layer, approx. 54'' x 64''. Protect the delicate screens on today's flat screen LCD and plasma monitors. Slip-over bags are offered in either foam or bubble wrap styles. Large sizes are designed to accommodate the most popular size monitors found in most office moves. Reusable, anti-static, zip-lock bags. 14'' x 24''. 1.8 mil thick, 55 yd. x 2''.